Skip the slopes, hit the trails! by Tom Tero, Newsletter editor. venture onto the loop trails that extended uphill from the river. Ordinarily I would avoid these on skis, they can be a bit too steep and icy for my moderate skiing skills. But on this day it was magical. I was breaking trail through several feet of the most impeccable snow I had ever seen. It hung in the trees like fluffy cotton and silenced all noise. If I hadn’t known better, I would have thought I was in some backcountry wilderness far away from civilization. Best of all, steep drops I would ordinarily have been terrified to ski down were made easy by the masses of snow. I just pointed the skis downhill and let ‘em rip. metal edges, poles, and appropriate ski boots. I use Fischer Spider 62’s and Fischer Outback 68’s for most of my backcountry touring. They have fish-scale bases that provide excellent grip without the need for messy waxes. Metal edges help you keep control and check your speed when going downhill. In deep conditions, you’ll want a pair of gaiters to keep snow from getting inside your boots. ■ Presumpscot River Preserve: As described above it has some challenging terrain but the trail along the river is generally flat and easy. For the advanced skier, there are some steep chutes to be found off the trail that can be incredible fun when there’s lots of snow. 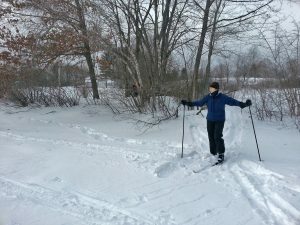 ■ Riverton Golf Course: Here you can find groomed trails for both classic and skate skiing. You don’t need metal edges for these trails. You can use skinny race skis if you want and get a super workout. forgiving and covers about 1 mile, ideal for a family with kids. ■Ocean Avenue Recreation Area: One of our newest conservation efforts is another good location for beginners. You can cruise around the old landfill by Quarry Run Dog Park on the wide path or venture into the nearby woods for some rolling terrain. These few are my favorites, but all of our trails systems can be skied as long as we get enough snow. Check out our trail map and take a look at our new interactive map to get some ideas for your next adventure.